 Normally, the manuscripts of Hildegard’s music indicate the final portion of the respond that is to be repeated as the repetendum or refrain by copying out the first few notes/words after the verse (the medieval version of a coda). However, both manuscripts lack any indication of the repetendum for this responsory. In her edition, Newman assumed the final phrase, per cuius...vexillata, would have served that role (Symphonia, pp. 164 and 286). However, such an assumption would violate the musical grammar, as per cuius begins on the high octave g rather than the final of the mode, G, and thus could not begin a new choral phrase after the final solo notes of the verse (immaculate, ending on the final G); see further in Beverly Lomer’s Notes on the music below. If we are to conjecture a repetendum for this piece, the only musically appropriate place to begin it is on the prior word, ipsius, which begins on the final G. Because our edition privileges the musical grammar, we have allowed this transgression of textual propriety to stand. And so, going forth, they made their way among the faithless peoples who did not have core connections [umbilicos], which is to say the sign of the knowledge of holy innocence and justice, and whose city, which is to say the instrument of God’s law, had been destroyed by faithlessness. And to these they announced the words of salvation and of the true faith in Christ. And thus they brought back many of this throng to the knowledge of God and led them to the core [umbilicum], which is to say the font of baptism, where they received the holiness that they lost by their proud transgressions. And they built the holy city of the commandments of God, thus rebuilding the city which the seducer the Devil had taken from them in Adam, and restored it to them in the faith that leads to salvation. After the illumination of baptism, which rose with the Sun of Justice Who sanctified the world by His own washing, the new Bride of the Lamb was adorned and confirmed in the fire of the ardor of the Holy Spirit for the perfection of her beauty. So also each of the faithful who is regenerated by the Spirit and water should be decorated and confirmed by the anointing of a bishop [superioris doctoris], so that he will be strengthened in all his members toward achieving beatitude and find himself most perfectly adorned with the full fruits of highest justice. Much of Hildegard’s emphasis in this vision of the confirmed citadel of the Church falls on the vital role of the bishops—the absolute successors of the apostles—as teachers. In the passage just quoted and at several other points in the vision, she uses the term “superior teacher” (superior doctor) for the office of bishop, and ties it directly to the the apostolic teaching that reveals the Trinity (three windows shining at the top of the tower). She again invokes the military metaphor that would reappear in O cohors milicie to describe that apostolic mission against the “ravening wolves” of the pagans, “so that by fighting they constructed the Church and strengthened her with strong virtues to build up the faith and adorned her with many brilliances [multimodis coruscationibus ornauerunt]” (Scivias III.4.3). Therefore, a person who has received the mystery of regeneration unto life has not taken possession of the fullness of churchly ornaments unless he is anointed in this way, as the Church is adorned by the glorious Holy Spirit. And as the Church is perfected by the gifts of the Holy Spirit, a believer ought to be confirmed by the anointing of the bishop [principalis doctoris], who is the reverend master [formidabilis magister] in the honor of the Holy Spirit; for the Holy Spirit by its fire brings forth and kindles sure doctrine in the Christian people. As the Scivias symphony continues its movement through the ranks of the celestial hierarchy, the initial ministry of the apostles as historical teachers and preachers of God’s true reality becomes the bedrock upon which Christ’s Bride, the Church, stands tall, entrusted with his banner of victory. Successive choirs will water that tower’s verdant grown with their blood and blossom as roses upon its walls (the martyrs) and continue that apostolic ministry within the sacerdotal offices (the confessors), while the dawn light will gleam green and beauteous with Hildegard’s own choir of virgins. This responsory forms the transition point by allowing the individual lights of the apostles to coalesce into Mother Church’s singular, joyous beacon. O lucidissima is a responsory of praise for the apostles as the pillars of the Church, who support her as the Bride of the Lamb. It opens with a two part melismatic salutation: O lucidissma, which begins on the final and finishes on F; followed by apostolorum turba, which begins and ends with the pitch F.
While Hildegard’s usual practice is to outline key phrases and words with the final or fifth of the mode, in this piece she shifts from G to F, with occasional excursions into other pitch areas. The word surgens is a fulcrum that connects the salutation to the beginning of the narrative, with the melody dipping down a third to D, while the subsequent phrase, in vera agnitione, ends on F. The next segment, et aperiens, also commences with D and is completed on F. Note the placement of tick barlines on lines 3, 5 and 8 of the first page of the transcription. These are intended to clarify the phrases, as the melodies are too long to place on one line as per our usual methodology. If one keeps in mind the stylistic shifts between G and F as outlining pitches, the phrasing after the salutation and opening of the narrative should be fairly straightforward, with one exception. On page 3 of the transcription, the text sense would appear to break between ipsius (line 3) and per cuius (line 4), as ipsius properly belongs with the previous phrase, in omnibus ornamentis. 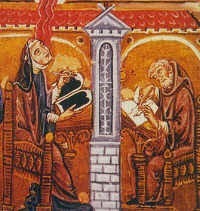 However, per cuius gaudium might alternatively function as an elliptical connector, which Hildegard frequently employs. The musical grammar of the melodic line interrupts the textual grammar: to end one phrase with the high G on ipsius and begin a new one with the liquescent on per makes less musical sense than the grouping we have chosen. We have included a tick barline on the main staff after est (line 5) to indicate that that a break should not be made after gaudium ipsa, i.e. lines 4-5 are a single phrase. In this segment there is also a significant difference between the sources, as shown in the ossia staves. Given that per cuius gaudium ipsa ends on D, the Riesenkodex version (in the ossia staff) might make more sense for mater et virgo est, which ends on F, in line with the general use of G and F as alternating outline tones in this piece. On the other hand, the Dendermonde rendition of the next segment, the melismatic vexillata, adheres more closely to the use of G and F as tonal markers; the Riesenkodex ending of the respond on pitch B seems odd. We would recommend following R for mater et virgo est and D for vexillata. It is our policy to add no editorial ficta. In this piece, there are a number of iterations of the tritone (interval of F to B, B to F). While the B flat is notated in some of these iterations, it is not in all, as medieval singers would have known to add them. We recommend judiciously applying additional B flats. Hildegard of Bingen, Symphonia, ed. Barbara Newman (Cornell Univ. Press, 1988 / 1998), pp. 164 and 286-7.